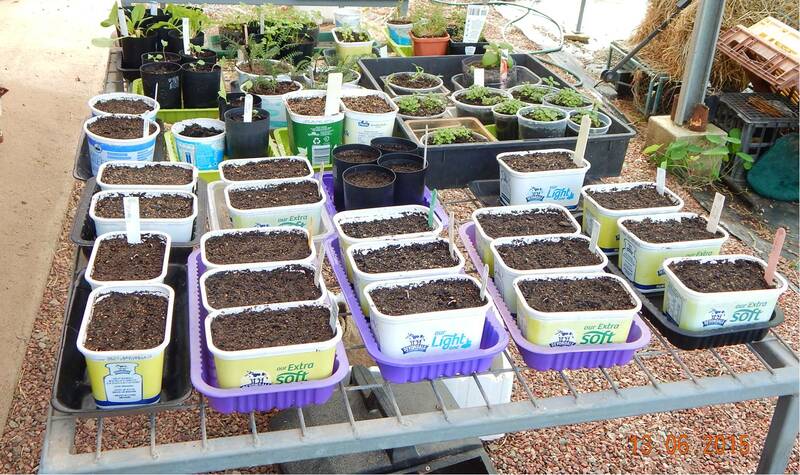 We’d like to share a potty recycling idea we employ, utilising plastic containers of various shapes and sizes in the garden as seedling pots. The biggest hurdle is being able to put holes in the bottom without splitting the plastic or hurting yourself with poky sharp tools! Well the answer is a soldering iron. A simple small soldering iron will melt your holes in a few seconds. You must do this outside in well ventilated preferably windy area so as not to breathe any burning plastic fumes. We like the butter containers the best, but the others work for us too. Soft drink and juice bottles work really well. See how we cut to different sizes depending on the depth of pot required. Milk bottles 1 Litre make fabulous tubes for faster growing bigger plants, however milk bottle plastic decomposes rapidly, so they only have a certain shelf life. The off-cut tops of the short soft drink bottle pots, also make good tubes. Most plastic tubs from the kitchen can be used, see in the pic below, we also use the plastic meat & produce trays from the supermarket effectively as saucers. Categories: Gardening, Handy Hints & Good Ideas | Permalink. Re purposing is always going to win over recycling. Love the idea and am going to use it. Enter your email address to follow DMK and receive notifications of new posts by email.